Might be cool if everyone shared a few words of wisdom in regards to training your dog. We all might pickup a few good hints???? Last edited by grant on Fri Feb 25, 2005 12:27 pm, edited 1 time in total. 15 Min. a day of training can be more productive than 2hrs on the weekend. Two days of training will be forfeited with two seconds of a lost temper. Don't EVER say "Find a bird" (or whatever your equivalent of that may be) if you are not in fact out trying to find birds. In training..............never give a command that can't be inforced! Teach commands or try things three times and rewards of treats an praises along with everyone having fun, is better than beating a dead horse. Follow a sequential program and when things don't go right simplify! Thats the very BEST one Duane. I like to tell people this about e-collar use-"When in doubt, don`t." Always end on a postive note and quit while it's still exciting and fun for them! Always make sure you set your dog up to succeed at the task presented him. Never give a command you're not in a position to enforce. 1- Dogs are pack animals. Be the leader. 3- Be patient and consistent. 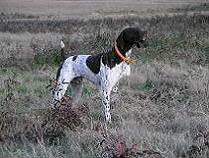 4- It takes birds to train a bird dog (no birds = no bird dog). 5- Quality dog work is not between you and your dog. It's between your dog and the bird. 6- Let your dog learn to manage the bird. 9- When working birds, your dog has not made a mistake until he puts a bird in the air. 10- The dog must know what the command means before he can be corrected for mistakes. command. It is used when the dog has a complete understanding of the command and chooses not to do it. An electric collar is for reinforcement only. 12- Give the command once, don't raise your voice, and always use a release command. 13- Never give a command you can't or won't enforce. 14- If you ignore or don't correct for an unwanted behavior, you are agreeing with and encouraging that behavior. Our goal is to create a well mannered hunting partner that, through minimal pressure or correction, has maintained all his natural style, desire and birdiness. COME IS NOT AN OPTION!! I neve end a training r a hunt on a bad note. I always make sure the dog does somethign correctly before we are done. Even if that means the dog has to do something as simle as "sit" I always end on a good note. My favorite thing to do is throwing tennis balls in a dimly lit yard and they get hot dogs upon retrieve. Duane took the single most important word when it comes to training dogs. I guess I'll just add - never train angry. If you are getting frustrated or out of sorts, it's time to stop. Once you get angry, you can pretty much only do harm when it comes to dog training. "When your feeling frustrated or just plain POed go get the puppys and leave the big dogs alone that day. Cant nothin but bad happen to the big dogs and puppys are the best cure for a foul mood." Same man who told me lack of patience has screwed up more dogs than any other tool ever has. For starters.....Don't believe the training advice you get from clowns on the internet. If you do some digging, you will find most of them have never trained a dog to any level of competence. They are phony trainers. Tough training dogs wearing these floppy shoes. Training is simply the process of decreasing the uncertainty in any given situation. If your dog does not want to come to you, do not chase him. Walk away in the opposite direction and, if necessary, hide. Never punish your dog when he finally decides to come to you. "When I was a kid, I used to pray every night for a new "puppy". Then I realized that the Lord, in his wisdom, didn't work that way. So I just stole one and asked him to forgive me". The more your dog loves you. The more they will do for you. 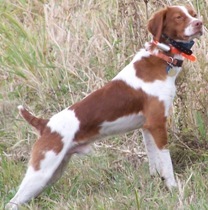 Several times this year both in training and in the field I have come up on my brittany on point and thought no way there can be a bird there, sure enough up it flies. Sergeant Hunter wrote: Trust the DOG! That one catches all of us. There's nothing more humbling than having to apologize to your dog, all the while they're giving you that "I told you so!" look. 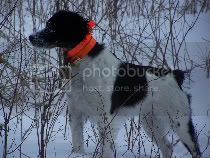 Deer Hunter wrote: If your dog does not want to come to you, do not chase him. Walk away in the opposite direction and, if necessary, hide. Never punish your dog when he finally decides to come to you. So what do I do when she does come back, just keep on going like it never happened? Either do nothing or lightly positively reinforce. Pet on the head a couple times. Good boy. He did come back. when training it always comes down to K.I.S.S. : Keep It Simple, Stupid. its amazing how we can make things so difficult. 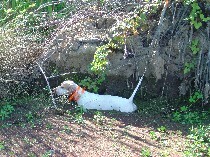 Deer Hunter wrote: Never punish your dog when he finally decides to come to you. A couple weeks ago my dog brought me a chukar. I had kicked up the planted bird and it flew a short distance into the woods. My dog remained steady while I fired a blank (I'm in the process of breaking her). I called her off and directed her to hunt the field we were working, which she did for about 50 yards before cutting right into the woods, round to my right, tracked the running bird out of sight for several minutes and delivered it to me. She was a bad dog, she did what I told her not to, she knew it, but I accepted the bird with a "good girl". Use quality good flying birds for training, don't waste time with junky birds. Homers and launchers also work great. Wild birds are best. Don't put your dog on birds everyday, once or twice a week is great. If you are breaking them maybe 3 or 4 days a week max. If they start getting bored take them off birds for a couple weeks. Just helps keep them intense. I will take it for this one. Watch your dogs body language. The Pup will tell you alot. Is he going to break? Is he going to try to blow you off? 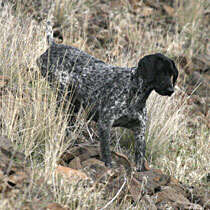 Short successfull training sessions make a confident dog. If you are hitting a wall, go back a few training sessions and do something that your pup understands and does. End on a good note. Then try again in a 2 or 3 days later and the light will usually come on. Make sure you go to the bathroom before you go afield. No sense in hurrying things. The best part of training is seeing the light come on in your little prot'eg'e. I have found that when you put a foot in the stirrup and get up on a horse to handle, 30 minutes or 1 hour or 3 hours. "I will be totally devoted to the dog, nothing else" not a time to visit, talk or whatever, totally devoted to what "your" dog is doing. Don't spray on bugspray right after you shave! Children seldom misquote you. In fact, they usually repeat word for word what you shouldn't have said. Breton13 wrote: Don't spray on bugspray right after you shave! Gee I do that all the time and hadn't noticed a problem! The Lower the level you are willing to drop to, to embarass yourself to train your dog, the better your dog will work with you. So get out there with those exctied puppy voices. I have no word's of wisdom. I'd have to credit other's for what ever it is I think I know. But one of my favorite's I read in Amer field and is a quote of Dr. Alvin Nitchman. He was watching a handler (?) screaming whoa at his dog that was busy running off. He turned to the guy next to him and said"
"I wonder what he tell's that dog when he want's it to stop and stand still"? Think about it. A hint from Delmar: "pay attention to what your training". Some people think to much like people and not enough like dogs! Read lots and lots on this forum. If your questions haven't already been addressed at some point, there are plenty of people ready to give advice about anything. Just be careful not to believe anything as absolutely always true. Lots & Lots Of PATIENCE!!!!!! It is o.k. to loose a battle every now and again as long as you win the war. An ol'timer once told me," You can always give a dog brakes but you can't always give'em gas." Nothing beats and early morning rise, be it a trout or a covey.